While there are challenges to fully utilizing FHIR, the specification will support workflows and provider experience between the organizations and multiple EHRs, Halamka said at HL7’s DevDays. BOSTON — Beth Israel Deaconess Medical Center and Lahey Health, along with three other hospitals, are currently in the midst of a mega-merger to bring the organizations under one umbrella. But as with most providers, they’re operating with a wide range of EHR vendors and versions. 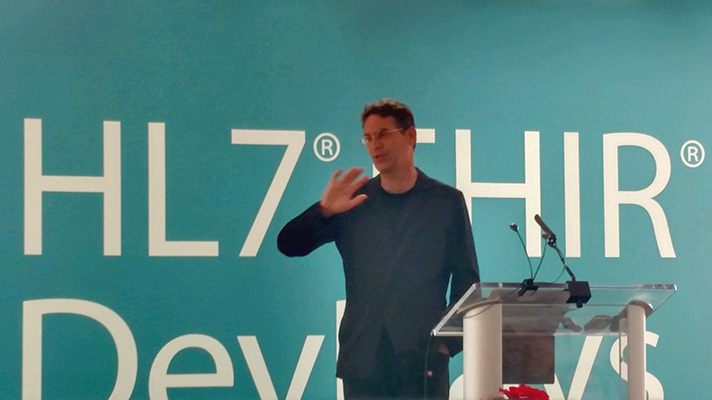 There are three instances of Epic, three different versions of Meditech, athenahealth and Cerner, and the assumption is that we’ll rip and replace these versions and put in one monolith EHR, explained John Halamka, MD, Beth Israel Deaconess CIO at HL7’s DevDays on Tuesday. “This will enable me for the next five years or so to keep the EHRs in place and give people a unified experience,” he added. “We need to see some kind of service to track patient identity -- demographics alone aren’t sufficient,” said Halamka. Instead, a service could break down patients by their first name, a relative’s name and other things that can help us figure out who you are. The quality and source of data also prove problematic, as the industry lacks standards, he explained. Consider consumer data, what should providers do with that data and how should it be interpreted? “I think, the answer is that we need metadata, around the data, and we hope, maybe as a society we develop rules,” Halamka said. For example, FitBit is allowed to have a variable heart rate, but with a pacemaker, it’s not allowed.